With over 1900 beds and 11 top hospitals in India, 2100 world-class doctors and 9300 support staff, Max Healthcare is one of the leading chain of hospitals in India. It has the most advanced technology, state-of-the-art infrastructure is rated the best in North India, thereby making Max Healthcare one of the best hospitals in India. Known for a warm and caring experience, the healthcare giant was looking to bring on board, a digital expert who could help them transform their digital engagement end to end. The pitch was interestingly complicated with multiple well versed agencies putting in their best and the reason why Olive won this pitch was because we demonstrated an eloquent understanding of the industry, the tools needed to place it on a digital platform, the subtle creativity in order to bring alive the element that sometimes facts can't and each and every specialty around health care. 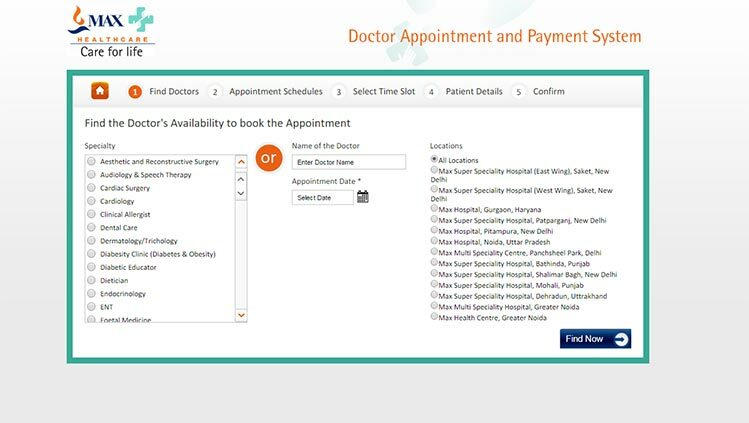 People don't usually surf through a hospital's website, but nevertheless, as and when the visitor accesses, it has to be updated with all the specific information. We envisaged that the digital platform has to offer each and every service that the hospital provides, for it to create a recall value in the customer's mind. 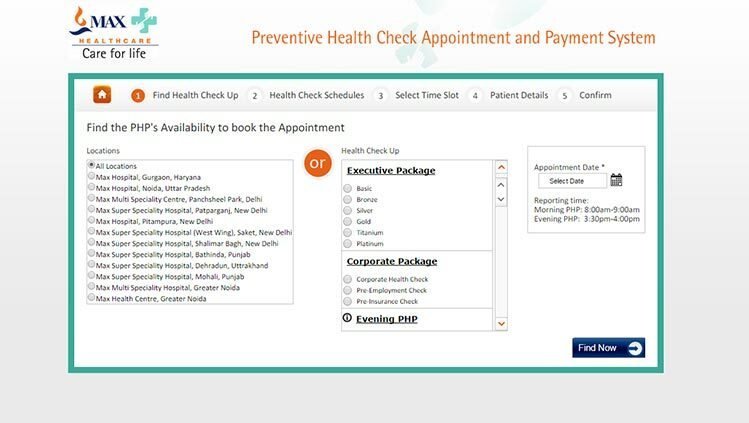 From a doctor's appointment to a video related to healthcare to a real-time query to a reminder about a regular health check-up, this website had to be the elixir for healthcare. This was one area where we sagaciously underestimated our wisdom and interviewed the stakeholders as intensively as we could in order to learn their understanding of the customer's needs. These multiple stakeholder interviews helped curate 'The' design for the digital platform in our minds, even before its inception. 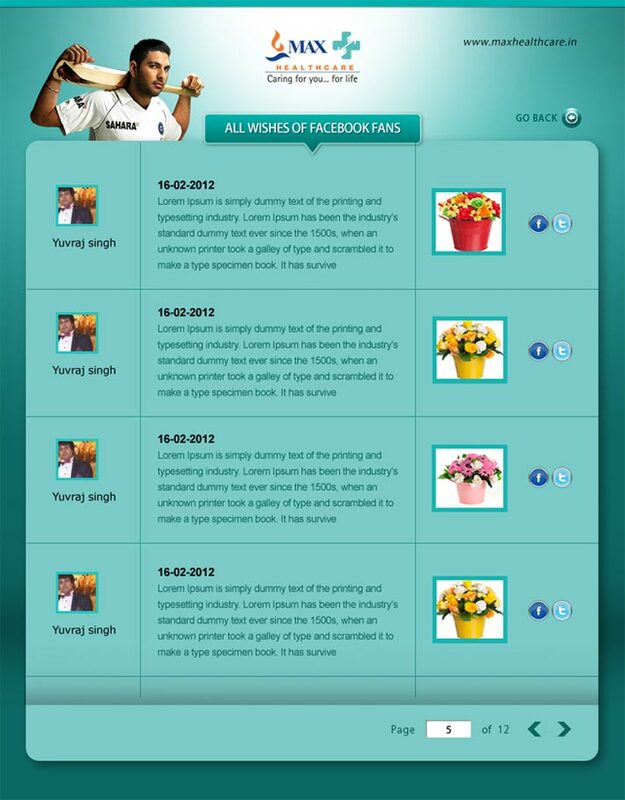 Later, this design went on to take the shape of an award winning website. 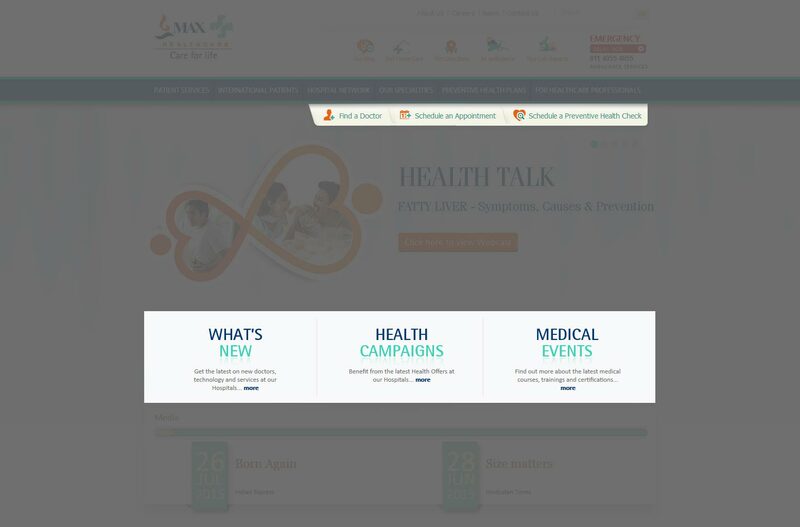 This being a healthcare website catering to people not really expecting to be wowed by a creative masterpiece, we instead decided to wow them with the hassle free experience of finding just about anything regarding Max and healthcare within a maximum of three clicks. Seamless navigation, relevant content, efficient functionality and user centered approach to design were at the heart of our strategy. 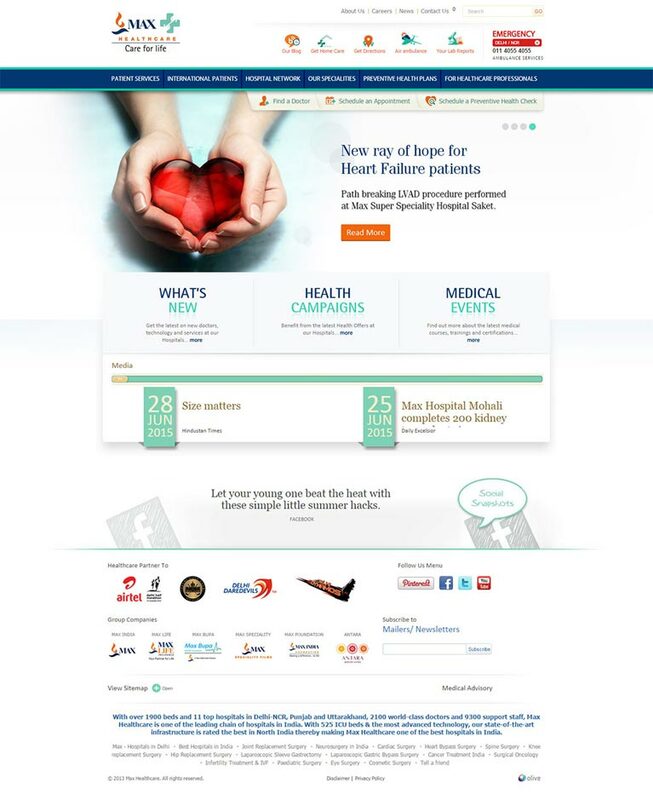 A two pronged content strategy helped us design an enabling platform for patients and caregivers looking for a specialist or a specific treatment as well as make sure we attract more users with our regular health related updates and an entire section on regular health checkups for the otherwise the hale and hearty. Our SEO service for the brand yielded commendable results with the data riding the ladder consistently. Three years into our rigorous SEO campaigning, Total Visits to the website increased by 367.66%, Page views increased by 315.50% and Organic Traffic increased by 292.05%. We worked on various microsites for them so as to not make the website very cluttered and at the same time not losing out on any important dimension of information. We worked on a separate web portal for metabolic and bariatric surgery as this kind of health concern is increasingly affecting lives with hectic lifestyles. Social media was leveraged through simple yet engaging and informative campaigns. A healthcare brand like Max Healthcare needed to connect with people not as a hospital but as a compassionate guide to a healthier life and in order to establish this image, campaigns ranging from Youth on the move – Encouraging the youth to pledge to donate eyes, How special is your mother- leveraging on the mutual health related concern for each other binding a mother and a child, Who are you? - Anti-smoking campaign connecting with non-smokers, smokers who quit and frequent smokers alike, Gift your dad a health check – leveraging on Father's day to create awareness about frequent health checks at older age, were effectively run on social media platforms attracting astounding response. Facebook Page 'Likes' increased almost triple fold and the momentum continued. 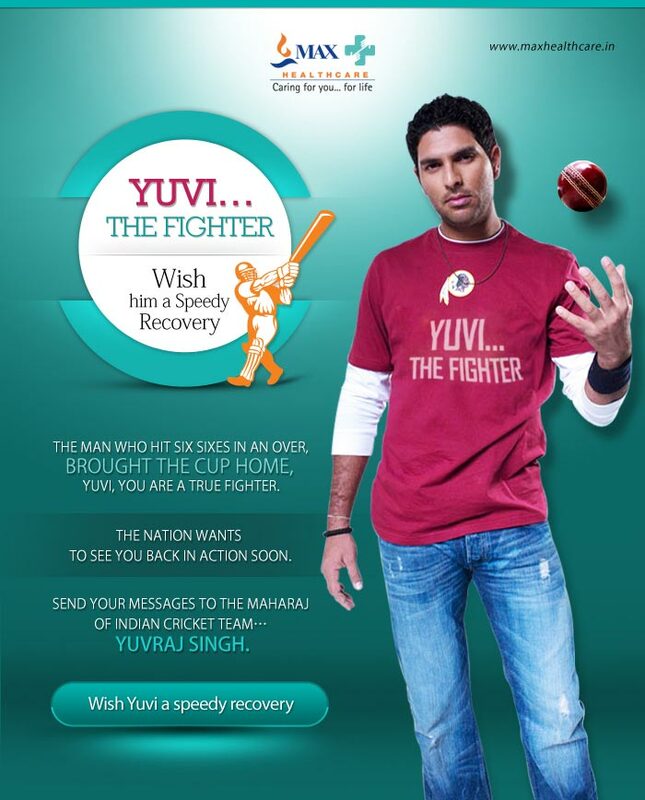 For preventive causes like breast cancer, diabetes and sound heart health, we used yahoo.com as a platform to communicate with the users and raise awareness in a subtle way trying to engage them as much as we could. The campaigns were designed in a way so as to facilitate sharing of knowledge by say sharing a pink ribbon on social media accounts to share awareness about breast cancer. 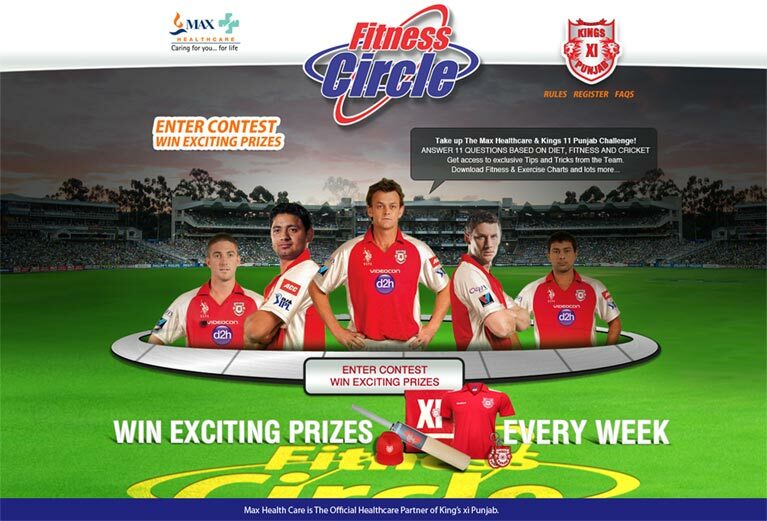 Another innovative campaign carried out by Olive for Max Healthcare was 'Maxkings XI'. 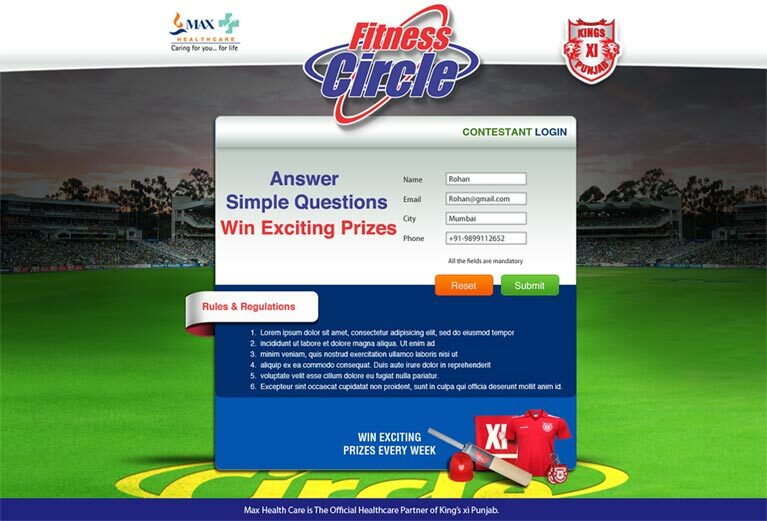 In this endeavour Max Healthcare associated with the IPL team, Kings XI Punjab and leveraging the popularity of the sport and the reverence that the country has for cricket players, we designed a campaign empowering Max Healthcare to subtly connect with the people bringing alive the brand message of fitness and a healthy life. 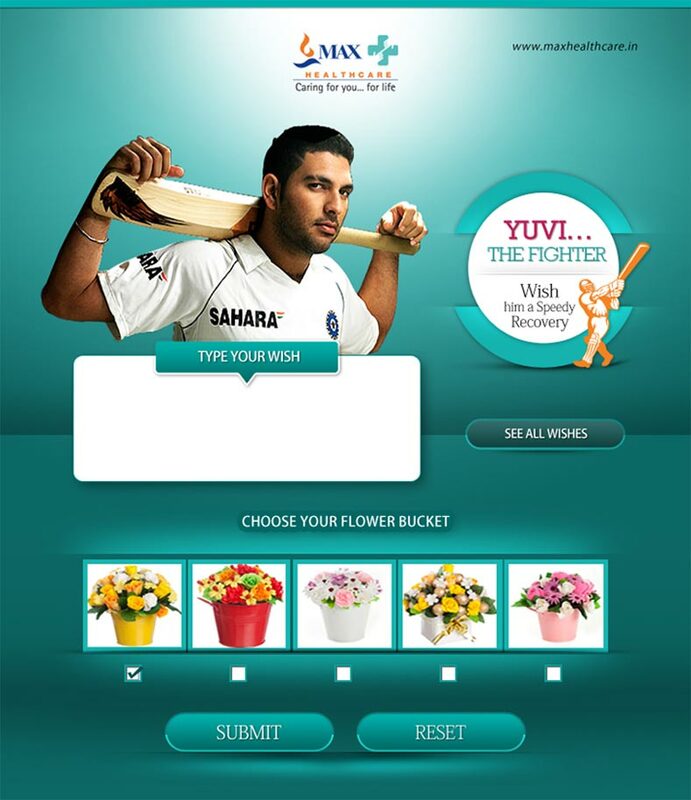 We designed a game compatible on social media wherein fans could choose to answer question based on his/her favourite player and win goodies. How healthcare came into the picture is that all the questions were centred around the player's fitness regime, diet charts and efforts to stay healthy and fit. By the time a fan would finish answering the question the image of Max Healthcare and interesting health tips and practices would be embedded in his/her mind. The page had 25,678 participants when the campaign started and managed to reach whopping 73,456 by the end of the campaign. 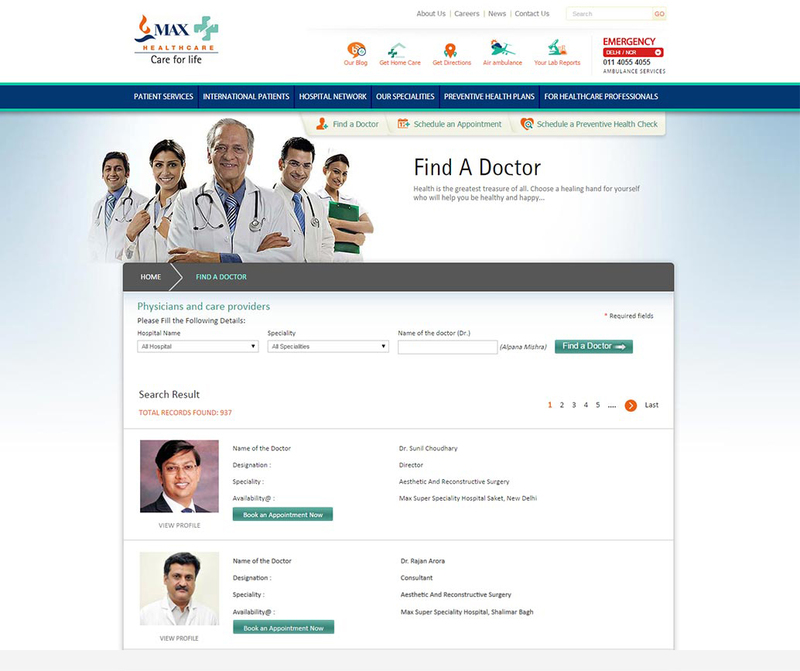 For this digital endeavor, Max Healthcare was facilitated with the 'Best Website Award' in the year 2013 by the Internet and Mobile Association of India (IAMAI). Period! 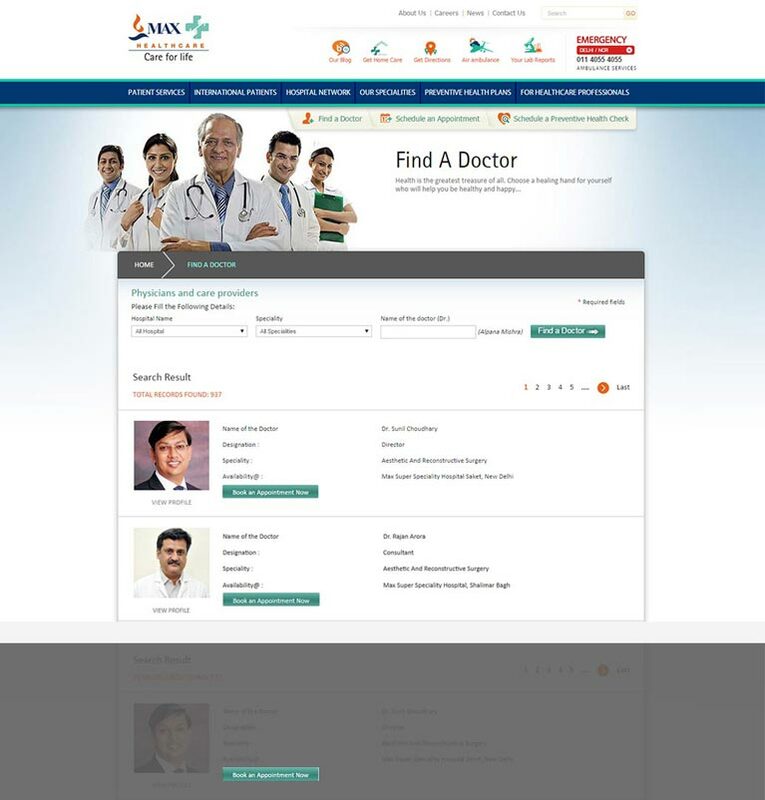 According to Mr. Anil Vinayak, Director – Sales & Marketing (Max Healthcare), proper implementation of website navigation makes it very user friendly. “The technology deployed is functional and relevant for the intended audience, thus adding on to maximum functionality. The early results, in terms of new and repeat visitors, and the number of appointments booked online, are very heartening. 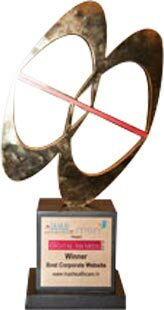 This recognition by an industry body of repute reaffirms that our efforts are in the right direction,” he further said.